I started talking about bead embroidery in the last post, and I thought I would lead you through my latest bead embroidery work in progress. Here’s a closeup photo of what I am up against. My original thought of doing a more minimalistic project was kind of dashed, because I needed to hide these marks somehow. Fortunately, the absolute worst was along the edge, so would easily be covered by the bead bezel. But what to do about the rest? I do have some thoughts and ideas; I’ll just have to see how they pan out in practice. When I got this cab (and it really is prettier in person; I haven’t been able to capture the gorgeous coloration), I wondered what colors I should use for the beading. I went through all the stash and found some pinks and purple that were about right. Then I decided that instead of competing with the cab, I should be setting it off. So I chose black. But, my plans are to use several kinds of black beads. I have both matte and opaque, in seed beads, bugles and matagamas. I may throw in some hematite colored beads; not sure on that yet. So stay with me over the next week or so, and you’ll see this cab bead embroidery project evolve. 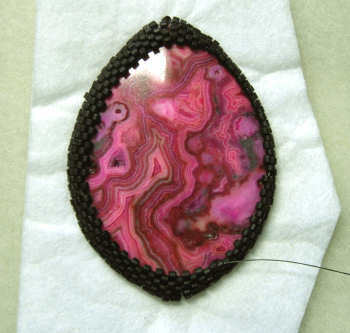 I am enjoying bead embroidery, so I am always on the lookout for cabochons to use. My favorite haunts are gem and jewelry shows, but alas, there won’t be any here for a few months. My own personal preference is sizes 25mm x 18mm up to around 45mm x 35mm. But I have been known to go higher and lower for a gorgeous cab. The pink one I am working on is something like 51mm x 38mm. Anyway, I’m taking a coffee break and seeing what else tickles my fancy for an upcoming project (in other words — time to go shopping). Then it’s back to work for my next installment on the above bead embroidery project. Bead embroidery — what exactly is it? The short answer is that it’s exactly what it sounds like – embroidering with beads. The long answer is that it’s an art form all its own! Yes, bead embroidery can get very elaborate, but it can also be fairly simple. You can make s small pendant or a ultra-fancy collar. Or anything in between! In all honesty, the only limitation is your imagination. How is Bead Embroidery Done? 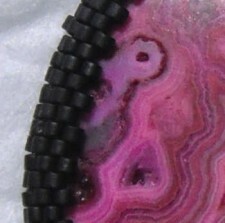 The most common way (these days) is by gluing a cabochon of some type to a backing. Then the cab is surrounded in beads in all manner of colors and patterns. The stitching is done down through the backing, so you are embroidering the top side. Sometimes, bead embroidery is done to that the cab isn’t glued to the backing, but rather the embroidery is built up so that it bezels the cab, thus holding it to the backing without any type of adhesive. This is generally done when a cab is valuable, or when adhesive might damage it. One example is when using rivolis; glue might damage the metal backing to the rivoli. I use a product called “Lacy’s Stiff Stuff”, which is firm, but your beading needle can easily sew through it. You can find it online, and beading stores generally carry it as well. I’ve also seen it a time or two at some of the craft stores, like Jo-Ann or Michael’s. Some people perfer to use suede or a microfiber fabric to the backing. Both of these are “floppier” than the Stiff Stuff, but it’s really a matter of what you are used to and like. A thick interfacing works well too (which is basically what the Stiff Stuff is, only not as stiff). I’ll be making some more bead embroidery soon (you ought to see all the cabs I have glued to backing I have waiting) and will share it them. 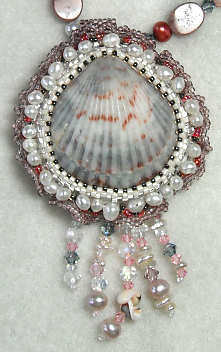 Meanwhile, you might want to check out my “Can-Can Cabochon” necklace tutorial for instructions for starting out in bead embroidery. P.S. – The photo above is one of the variations I include in the Can-Can tutorial. Yep, the sky is the limit when it comes to bead embroidery. Simple to sensational, it’s all up to you.